When I think about creating a Dream Bedroom, I wonder what my early teen self would have chosen if the budget had been endless? 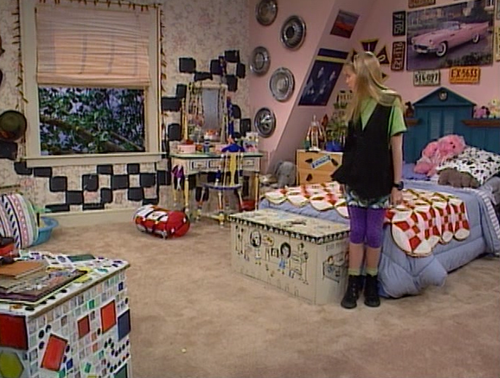 I remember loving the bedroom in Clarissa Explains It All…she had everything a girl could want; the space, the window where the boy next door entered, (although looking back now, how dangerous is that- anyone could get in for goodness sake!) She had that cool telephone and I’m sure there were steps from the door up to the bedroom- steps in a bedroom- how cool! Looking at this now, it makes my head hurt! Times have certainly changed! As I approach a new age (oh god) and as a newly wed (I wonder if five months still count as a newlywed?! ), I reflect on what my Dream Bedroom would consist of now? Three ideal themes spring to mind; Romantic, Relaxing & Inspiring. As part of the Dream Bedroom Blogger Competition hosted by the very cool Love Chic Living, I have created a fantasy bedroom, dreamily picking items from the bedroom collection at Debenhams, using just a small portion of the monopoly style £5000 budget that we were given. My Dream Bedroom (see my mood board above), would have to reflect the Romantic in me. The gorgeous bed linen, aptly named ‘Monroe’ (£46.00), along with comfortable accessories such as the Cream Faux Arctic Fox Throw (£56.00), Natural Wool ‘Love’ cushion (£50.00) and the ‘Fabulous’ Sateen Pillow (£50.00) would all help to create a magical and lovable setting to the bedroom. Even the Decadent Hand Mirror by Julian McDonald (£10.00) screams Disney Princess to me! Lighting is an important asset to any room and in my Dream Bedroom I would have cute bedside lights, just like the Metallic Table Lamps (£28.00) to compliment the Burlington Range at Debenhams. The romantically named Romeo 5 Cream and Gold Chandelier (£103.00), would add a delicate finishing touch to the room. The Garden Lily Scented Candle (£12.00) and Diffuser Set (£12.00) will enhance a unwinding atmosphere when you need to reflect and Relax at the end of busy day. My Dream Bedroom would also have a carefully positioned armchair, one very similar to the Tan Leather ‘Paris’ armchair above (£540.00), were I could sit, read and write and be Inspired. Ah if only all dreams could come true! How would you create your Dream Bedroom? For inspiration and more ideas head over to Debenhams now!